15 Cute, Fun and Colorful Children's Recliners for Sale! Top Children’s Recliners for a Fun Bedroom! Children have the best reclining chairs! They are so cute, fun and colorful! My favorite ones are the Disney recliners! A cute child recliner makes a great gift idea for their bedroom! They also love using their fun recliner to watch TV and read their favorite books! 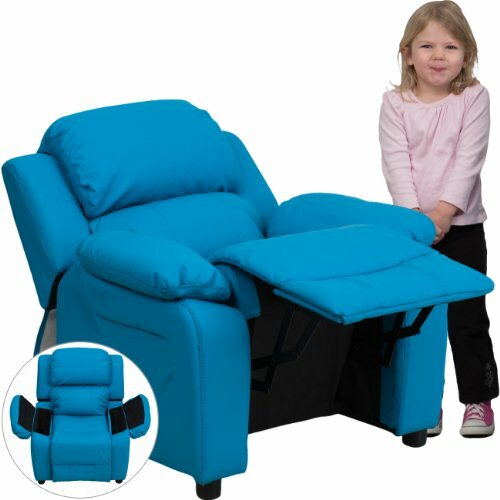 I gathered here the most fun, cute and colorful children’s recliners for sale! 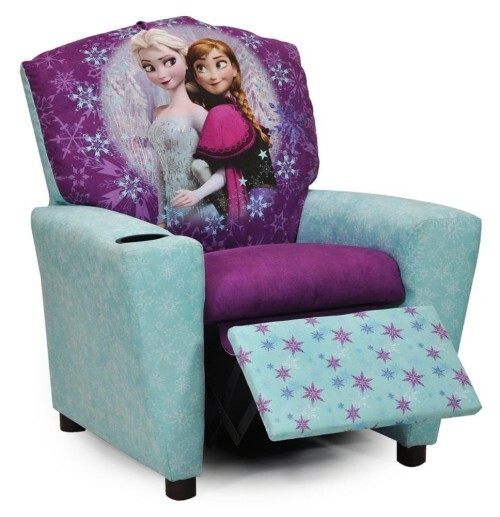 How cute and adorable is this Frozen girl’s recliner for sale? Is that perfect for your toddler girl’s bedroom or what? She is gonna love having this cute reclining chair! It is perfect for your 3 year old daughters and granddaughters who also love the Frozen movie! The blue and purple colors are gorgeous and it also has a plastic cup holder! The fabric is also very easy to clean up using a sponge with some soap and water. Very Cool Disney Toy Story 3 Children’s Recliner with Cupholder! The Most Fun Recliners for Kids! Children absolutely LOVE Toy Story! 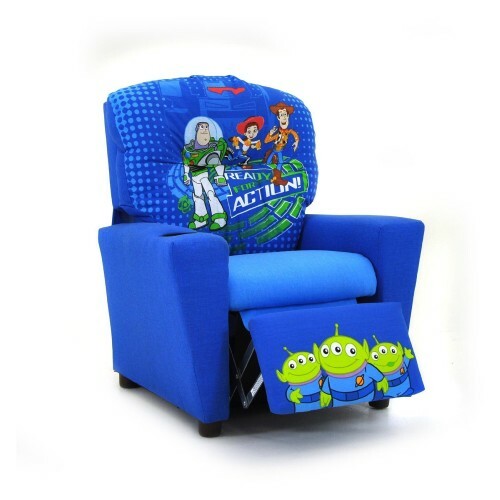 This fun Disney Toy Story 3 recliner is one of my favorite child recliners for sale! Makes everyone smile right away! It is very cute, very comfy and also sturdy! Perfect for children between the ages of 3 years old and 7! 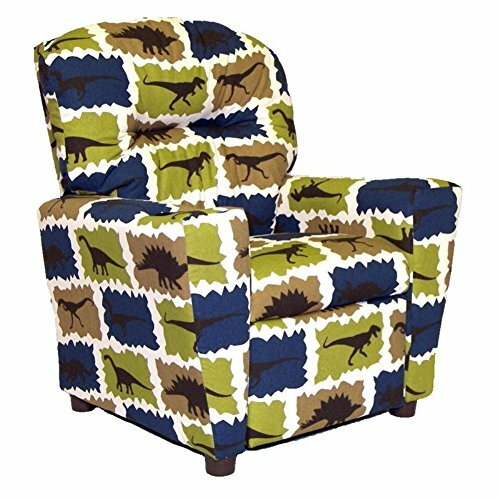 Awesome Dinosaur Print Recliner for Boys! If you have a 3 year old little boy and he loves dinosaurs, then I think this is the perfect recliner for his bedroom! It is a cool dinosaur theme recliner! The colors are amazing and so is the fun dinosaur design! It also has a handy cupholder to keep your little one refreshed and thirst free while watching his favorite movies and cartoons on TV! Best Child Recliners for Boys! 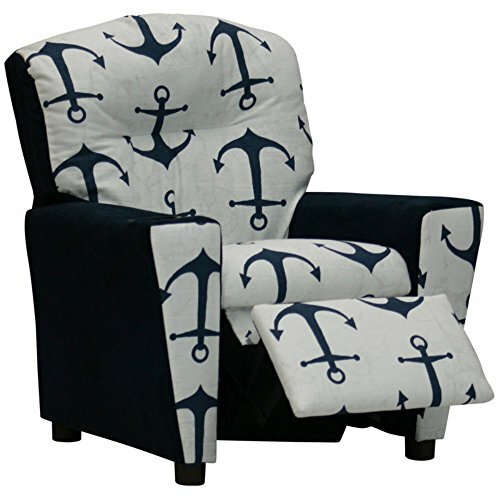 How awesome and unique is this navy blue nautical themed boy’s recliner for sale? It fits little boys ages 3 to about 7 years old! I love the very cool anchor designs! How is that for your future captain? 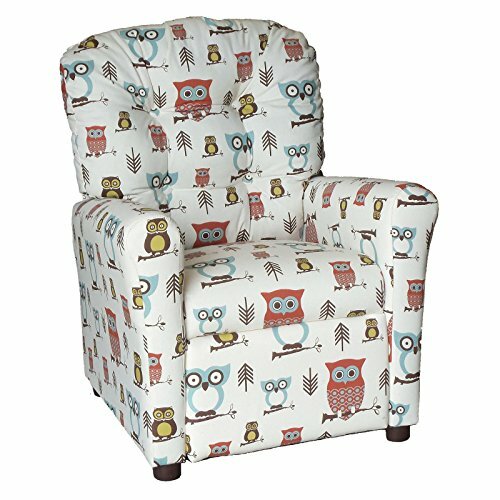 Adorable Retro Owl Design Recliner for Kids! Look who is here now! This is one of the most adorable children’s recliners around! Perfect for a little boy or a little girl’s bedroom! Too cute for words! Woot! Woot! 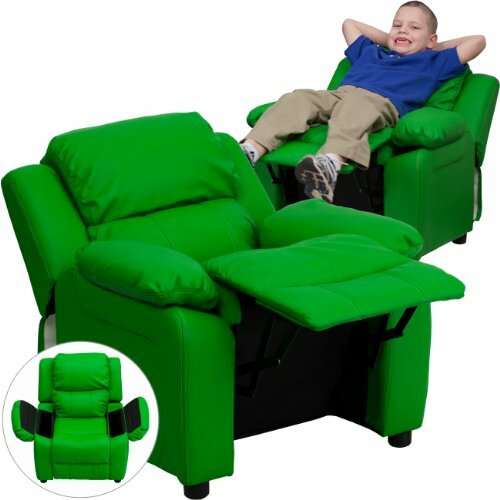 FUN Green Vinyl Kids Recliner with Storage Arms! 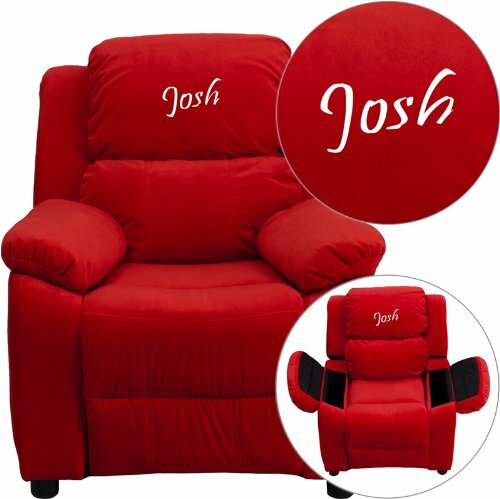 Another adorable child recliner for toddler boys or girls! It is a FUN bright GREEN vinyl kids recliner with storage arms! Perfect to create a fun bedroom for your little one! Cute and Colorful Mickey Mouse Clubhouse Recliner with Cup Holder! My Favorite Disney Recliners for Kids! 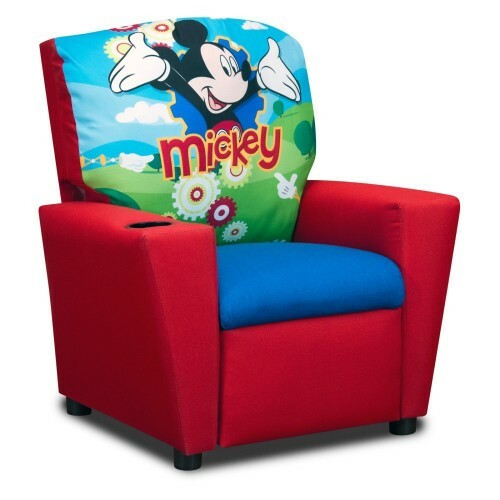 If you are looking for the cutest Disney recliners for kids being sold, how cute and adorable is this colorful Mickey Mouse recliner with a cup holder? Will brighten up any toddler’s bedroom! Fits children ages 18 months up to about 3 or 4 years old! Adorable Disney Minnie Mouse Recliner for Little Girls 3 and up! 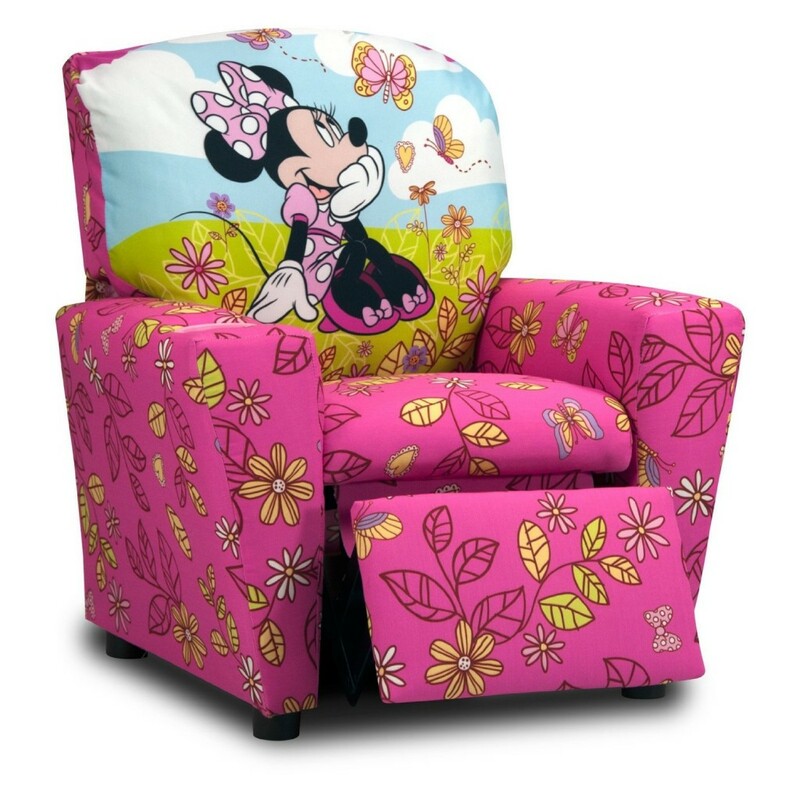 The most adorable Minnie Mouse child recliner for your little girl! The recommended age is 3 years old and up, but some buyers bought it for their 2 year old girls. Minnie Mouse looks absolutely lovely enjoying the pretty flowers and butterflies! 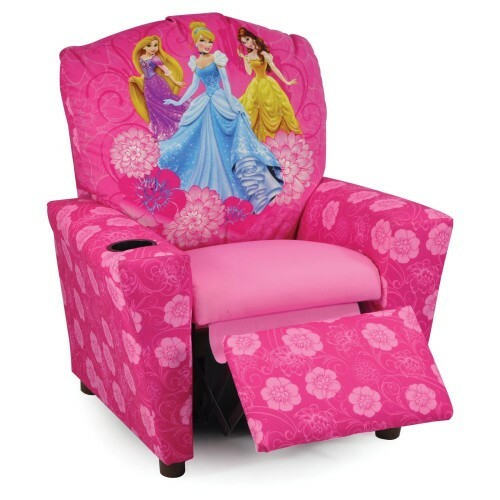 Very Cute Disney Princess Pink Recliner for Girls! Of course we couldn’t talk about Disney recliners for kids without also showing a cute Disney Princess pink recliner for girls! Will make your little girl’s bedroom just magical! Great gift idea for little girls between the ages of 2 and 7 years old! Gorgeous Hot Pink Personalized Child Recliner for Girls! This cute and fun hot pink personalized recliner for girls is not only very pretty and very unique but also very cozy and soft to use! I cannot think of a more adorable reclining chair for a new baby’s nursery or pink themed bedroom!! The fabric is also easy to clean, just use soap and water! 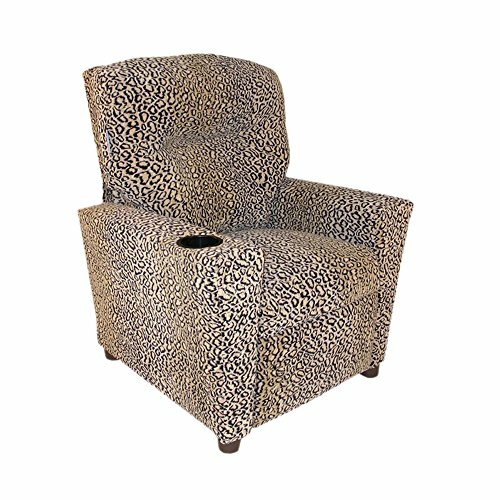 Cute Animal Print Kids Recliner! Of course I wouldn’t forget to also add a cute and fun animal print recliner with cup holder for girls here! 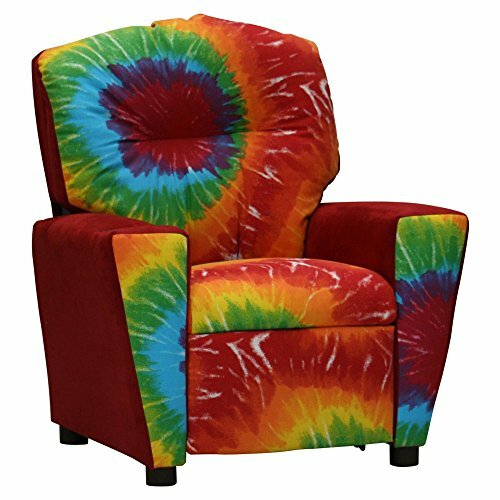 A stunning tie dyed rainbow colors kid’s recliner with a cup holder! Will immediately brighten up your child’s bedroom! It fits kids up to 7 years old. I found another ultra-cool and fun kids recliner for sale! Love the gorgeous turquoise color and the cool storage arms! How’s that for your little one’s bedroom? Seems to be extremely comfy too! Look how it reclines all the way down! 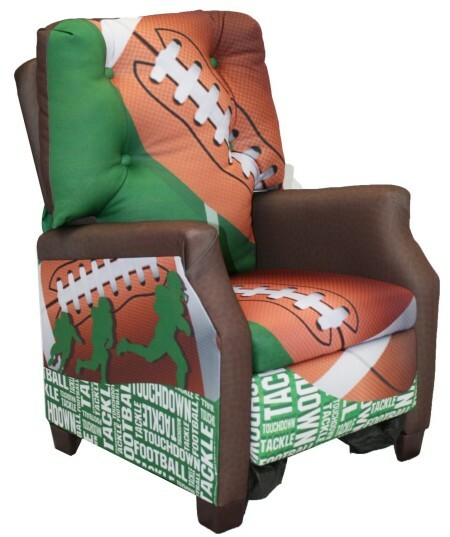 Kids Football 50 Yard Line Themed Recliner for Boys! And I also found this cool football themed recliner for little boys! Perfect to complement a fun ‘football theme’ bedroom decor! *I hope you had fun here today choosing a fun recliner for your child!